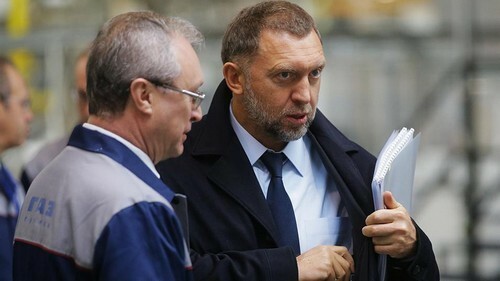 In December, as news reports emerged about potential new U.S. sanctions against Russia, aluminum magnate Oleg Deripaska instructed advisers to draw up contingency plans, according to people close to the businessman and his firms. Senior executives, lawyers and aides working for the Russian tycoon met almost weekly to develop a game plan for different sanctions scenarios, the people said. They even took preemptive steps to mitigate the impact of sanctions, including switching most dollar payments and loans of Deripaska’s En+ Group PLC into euros and British pounds as well as planning to replace U.S. equipment suppliers with European ones, according to one of the people involved in the planning. But they concluded there was one scenario so severe that there would be little they could do if it came to pass: the stiffest sanctions being applied to his business empire, not just Deripaska himself. It was this scenario that Washington chose. On April 6, it announced sanctions against Deripaska and his eight companies, along with other Russian individuals and firms, in response to what the United States called “malign activities” by Russia. By adding Deripaska’s businesses to its Specially Designated Nationals blacklist — the first time Washington had done so with a publicly-listed Russian company — the U.S. effectively choked off their access to the international financial system. The move sent reverberations around the world. Deripaska’s business empire — which includes United Company Rusal PLC, the world’s second largest aluminum producer by volume of production — has a global footprint and counts major international companies as customers. The extent of the impact shows the power the United States exerts over the global financial system through the dollar clearing process. Rusal, the largest part of Deripaska’s empire, has seen customers stop buying its aluminum and creditors scramble to offload debt. Hong Kong-listed Rusal has lost more than 60 percent of its share value. Deripaska’s En+ Group PLC, which owns part of Rusal and supplies power and coal, has also seen its London-listed shares more than halve in value. A spokeswoman for Deripaska declined further comment. Rusal has said its inclusion on the sanctions list could leave it unable to pay billions of dollars it owes to its lenders – some of the leading Western and Asian banks. On Monday, the United States opened the door to sanctions relief for Rusal when the Treasury said in a statement it could soften the measures if Deripaska ceded control in the firm. The Treasury said its goal was to avoid hitting businesses around the world which depended heavily on supplies from Rusal. The news sent shares in Rusal up more than 13 percent in Moscow, but they remain far below pre-sanctions levels. The team assembled in December consisted of about a dozen top managers – including executives from finance, legal and human resources – and aides to discuss ways to mitigate the impact of sanctions on Rusal. A similar team gathered to focus on En+, according to the people familiar with the planning. The groups met in their separate Moscow offices and gave regular updates to Deripaska, in person and by emails, the people said. The biggest concern was that tough sanctions against Deripaska’s businesses would stop Western banks and clearing houses from interacting with them, impacting everything from raising debt to sales on world markets, according to the people. Deripaska took pre-emptive steps. In February, the billionaire announced his resignation from executive positions at En+ and Rusal. The hope, according to one source close to Rusal, was that he would protect the companies from sanctions even if he was put on the list himself. Deripaska made other changes out of the public eye. In a previously unreported move, En+ had by March switched most of its dollar payments and loans into euros and pounds, according to a person familiar with En+ preparations. That means the company can service its debts and receive payments which otherwise would have stopped if they remained dollar-denominated. Another key concern was the impact sanctions would have on suppliers of equipment to Deripaska’s firms, as tough sanctions against his entities would prohibit U.S. companies from doing business with them. The En+ team of advisers put together a plan aimed at cutting exposure to U.S. turbines suppliers such as General Electric and replacing them gradually with European firms, the person familiar with En+ preparations said. “But on a number of other issues we hit a road block,” the person said. He cited a failed pre-sanctions attempt to find a non-U.S. bank to act as a depositary for En+’s London-listed shares, known as Global Depository Receipts or GDRs, a role then held by Citigroup Inc.
“We tried EU banks, Hong Kong banks, even an Israeli bank – but as soon as we mentioned possible sanctions, it wasn’t going anywhere,” the person familiar with En+ preparations said, without naming the banks. The person added the En+ group also looked into moving trading of its GDRs to Moscow from London but concluded a new initial public offering would be needed to achieve that. “We simply didn’t have that time,” the person said. When the sanctions were announced in April, Citigroup, the custodian for GDRs at En+, suspended all transactions. The move rattled investors because the sanctions require that U.S. citizens must divest of any stocks, bonds or other holdings in the targeted firms by May 7. Several days later, Citigroup informed En+ that it had begun facilitating transactions again with its GDRs, according to a statement from En+. Citigroup declined to comment. But, according to the person familiar with En+ preparations, holders of En+ GDRs have not been able to sell because the designated clearing house Euroclear is not settling the trades, the stage at which cash and securities trade hands. Belgium-based Euroclear declined to comment. The Rusal contingency team felt like it had fewer options than their En+ counterparts because the metals producer had a much larger portion of debt and contracts in dollars due to the nature of the aluminum market, according to three people close to Rusal. One of these people also said the aluminum company didn’t prepare well for the toughest sanctions, because Deripaska and the contingency team believed the United States would not want to disrupt the aluminum markets and because the U.S. had not levied sanctions against a publicly traded Russian firm before. Rusal had no plan in place for requesting immediate help from the Russian government to assist in refinancing debt or paying its employees, according to the three sources close to Rusal. Russia’s industry and trade minister told reporters last week that the government had not received a detailed request for help from any of Deripaska’s companies. The people close to Rusal also said such requests have not been filed, although two of them added that the company was working on such a request. A Kremlin spokesman said on Thursday that a temporary nationalization of Rusal was among options the Kremlin was studying to help the company navigate sanctions. Russia’s prime minister has described the sanctions as an attempt by the United States to capture new markets for its companies and directed the Russian government to study measures to support firms under fresh sanctions.